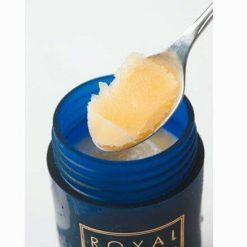 Raw royal jelly, extracted with utmost care and flash-frozen to preserve its freshness. Royal jelly is made by worker bees to feed the larva of the bee whom they have chosen to become their next queen. Like other bee-derived products and supplements that have become popular in recent years, such as bee pollen and raw honey, It has a surprisingly diverse range of powerful effects that are beneficial to your health. Royal jelly is expensive because only 10–20g can be collected at a time, and no more than 700g per year from a single beehive. This process takes about 60 hours. Then, after it is collected and filtered, we flash-freeze it so that it can be delivered fresh to your door. The active protein in royal jelly, royalactin, has been shown in a study to reduce blood pressure. This means that consuming royal jelly could alleviate or prevent hypertension, and by extension, lower the risk of heart disease and stroke. It also improves glucose levels in some people, which makes it beneficial for those with type 2 diabetes. Royal jelly can also block the effects of BPA (bisphenol A), a chemical found in various plastics, packaging, and other environmental sources. High amounts of BPA can promote the growth of breast cancer cells, making this supplement a cancer-fighting substance. While royal jelly is used to nourish queen bee larvae, it can also help men, too: even tiny dosages of the supplement have been shown to increase male testosterone levels by one-fifth, as well as increase sperm motility. 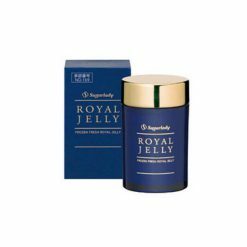 The vitamins in royal jelly will break down if consumed with hot tea or coffee. As the active ingredient is a protein, it may cause an allergic reaction in a very small number of cases. If this happens, do not take any more capsules. Royal jelly is best consumed in small amounts every day, rather than at once in large amounts. 1–2g at a time is ideal. Spoon out the desired amount and enjoy. Mix with honey or stir into milk if you find it difficult to consume as is. This product contains raw royal jelly (Taiwan). Taiwan production: raw royal jelly (Taiwan). Prepared and packaged in Taiwan.